Proyecto Integra-tic. Colegio Público "Luis Gil"
Entrada publicada el 8 abril, 2010, por Roberto E.
“In Ancient Greece, there were lots of temples for all the different gods, such as Zeus, Aphrodite and Apollo. The Parthenon in Athens was a temple for Athena. She was the goddess of war and the patron of Athens. 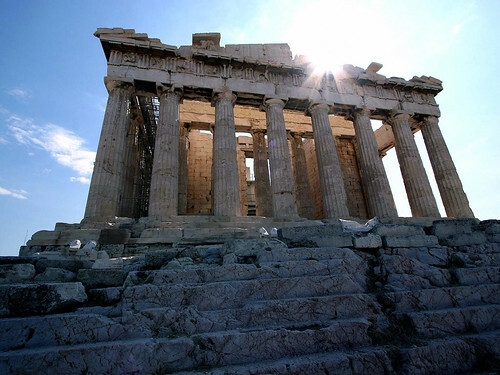 Today the Parthenon is in ruins, because an enormous explosion destroyed the original temple in 1687. Now it is still in danger -from the effects of traffic pollution!“. Entrada publicada en Listening, Reading, Year 6. Guardar el enlace permanente. "One piece of the jigsaw is missing"
"Falta una pieza del rompecabezas "
What’s the weather like in Sangüesa?